How to Choose a Suitable Network Switch? A network switch is a small hardware device that centralizes communications among multiple connected devices within one local area network (LAN). Network switches come in different sizes, features and functions, so choosing a switch to match a particular network sometimes constitutes a daunting task. This blog will give you a few useful things to consider when choosing the appropriate switch for a layer in a particular network. While switching capabilities exist for several kinds of networks, including Ethernet, Fibre Channel, RapidIO, ATM, ITU-T G.hn and 802.11, network switch can operate at one or more layers of the OSI model. Switches provide multiple advantages in network designs. All switches provide the basic traffic filtering functions, which improves network bandwidth. Besides, the internal switching circuits allow traffic flows to simultaneously occur between multiple ports. Currently, mainstream network switches support Gigabit Ethernet speeds per switch port, but high-performance switches in data centers generally support 10 Gbps per link. Different models of network switches support varying numbers of connected devices. Home network switches provide 4/8 connection for Ethernet devices, while SMB switches typically support between 32 and 128 connections. Careful planning before purchasing a switch will save you money. At the same time, it can help you ensure the equipment has the functionality that you organization is needed, or the switches can expand their capabilities as your requirements change and grow. Here are some suggestions you can use to help guide your switch purchase. The number of users and the basic network infrastructure determine the number of ports. Common numbers of ports on network switches are 5, 8, 10, 24, and 48 ports. If you only have 5 or 6 users, then a small 8 port switch will probably be enough for your needs. Number of ports is one of the biggest factors in the cost of a switch, so if you buy a switch that only supports the number of users that you will have, you will likely save a fair amount of money. Fixed switches come in Fast Ethernet and Gigabit Ethernet. Fast Ethernet allows up to 100 Mb/s of traffic per switch port while Gigabit Ethernet allows up to 1000 Mb/s of traffic per switch port. These ports may be a combination of SFP/SFP+ slots for fiber connectivity, but more commonly they are copper ports with RJ-45 connectors on the front, allowing for distances up to 100 meters. With Fiber SFP modules, you can go distances up to 40 kilometers. Currently, Gigabit Ethernet is the most popular interface speed though Fast Ethernet is still widely used, especially in price-sensitive environments. If you have a 24-port switch, with all its ports capable of running at gigabit speeds, you could generate up to 24 Gb/s of network traffic. If the switch is connected to the rest of the network by a single network cable, it can only forward 1 Gb/s of the data to the rest of that network. Due to the contention for bandwidth, the data would forward more slowly. That results in 1 out of 24 wire speed available to each of the 24 devices connected to the switch. Therefore, the more ports you have on a switch to support bandwidth aggregation, the more speed you have on your network traffic. Core Layer Switches: These types of switches are routed at the core layer of a topology, which is the high-speed backbone of the network and requires switches that can handle very high forwarding rates. The switch that operates in this area also needs to support link aggregation to ensure adequate bandwidth coming into the core from the distribution layer switches. Because of the high workload carried by core layer switches, they tend to operate hotter than access or distribution layer switches. Virtually, core layer switches have the ability to swap cooling fans without having to turn the switch off. Distribution Layer Switches: Distribution layer switches plays a very important role on the network. They collect the data from all the access layer switches and forward it to the core layer switches. Distribution layer switches provides advanced security policies that can be applied to network traffic using Access Control Lists (ACL). This type of security allows the switch to prevent certain types of traffic and permit others. Access Layer Switches: Access layer switches facilitate the connection of end node devices to the network. For this reason, they need to support features such as port security, VLANs, Fast Ethernet/Gigabit Ethernet, Power over Internet, and link aggregation. Port security allows the switch to decide how many or what type of devices are permitted to connect to the switch. At any layer, a modern switch may implement power over Ethernet (PoE), which avoids the need for attached devices, such as a VoIP phone or wireless access point, to have a separate power supply. Since switches can have redundant power circuits connected to uninterruptible power supplies, the connected device can continue operating even when regular office power fails. 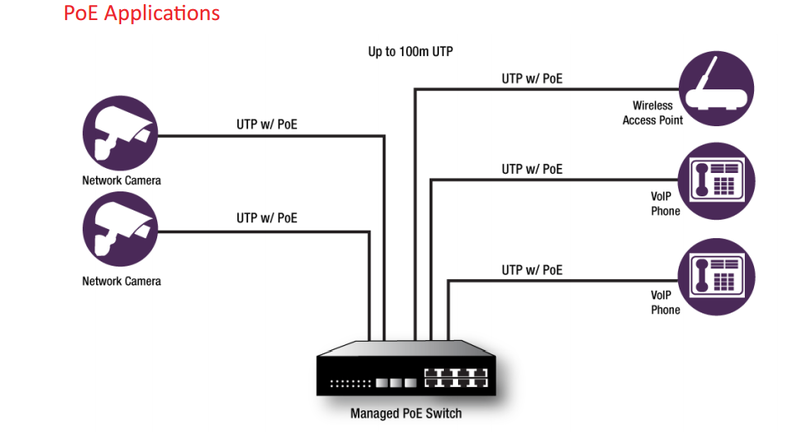 Another characteristic you consider when choosing a switch is PoE. This is the ability of the switch to deliver power to a device over the existing Ethernet cabling. To find the switch that is right for you, all you need to do is choose a switch according to your power needs. When connecting to desktops which do not require PoE switches, the non-PoE switches are a more cost-effective option. As the network grows, you will need more switches to provide network connectivity to the growing number of devices in the network. When using standalone switches, each switch is managed, troubleshot, and configured as an individual entity. In contrast, stackable switches provide a way to simplify and increase the availability of the network. With a true stackable switch, you can connect the stack members in a ring. If a port or cable fails, the stack will automatically route around that failure, many times at microsecond speeds. You can also add or subtract stack members and have it automatically recognized and added into the stack. As you can see, there is a multitude of network switch options to choose from. So, have a close look at your current deployment and future needs to determine the right switch for your network. FS.COM is one of the network switch vendors, if you have any demand, welcome to visit our website. PoE is a networking technology that supplies power to network devices over existing data connections. Various applications in our life, such as new wireless access points, cameras and some types of security devices, are using this technology. Because it can bring many benefits: one cable for both power and data transmission; simpler deployment of devices; no need to upgrade existing cabling systems. This post explores some basic knowledge about the main elements in PoE technology. The IEEE 802.3af is a standard that defines how power would be delivered to devices utilizing 10BASE-T, 100BASE-T and 1000BASE-T technologies. It defines delivery of up to 15.4 watts per port to Ethernet devices, typically using 48 volts. Generally, many devices like IP phones, hand-held PCs, magnetic card readers are being developed to utilize IEEE 802.3af. Besides, this standard also defines two major pieces of hardware, the power device (PD, receiving power) and power sourcing equipment (PSE, delivering power to PD). Except the function to deliver power to PD, the PSE has other two functions: detect a PoE capable PD and monitor and terminate the supplied power. There are two types described in the definition of a PSE: endpoint PSE and midspan PSE. An endpoint PSE is a PoE capable port on a switch that is directly connected to the cable supplying power to the PD. Power is delivered by the endpoint PSE using either the active data pairs (usually the orange and green pairs in Ethernet—Pins 1,2 and 3,6) or the spare pairs (usually the brown and blue pairs—4,5 and 7,8). These two delivery methods are referred to as alternative A and B. Alternative A uses the active data pairs; and alternative B uses the spare pairs. Just like the following picture shows. In order to be 802.3af compliant, the PSE must support both alternative A and B. However, only one method will be used to provide power to a device. Typically, this will be the A method for the standard 802.3af PSE. As have mentioned above, PD is a device to receive power. An 802.3af compliant powered device is able to accept power using either the alternative A or B method. It doesn’t support receiving power on devices that require power on either the data pair or spare pair that are not compliant, nor the devices that need power on four pairs. What’s more, PDs can be qualified into classes according to their power needs. In a start-up process, when a PoE connection is made, the PD can advertise its power class to show how much power is required. The following picture is an example. PoE plus was created in 2004. It’s an update to PoE. And it compliant to the IEEE802.3at, aiming to provide more power for devices. That’s the major difference between PoE and PoE plus. Besides, the PSEs of PoE plus can supply power to both PoE and PoE plus PDs. But the converse version cannot go through, for PoE plus PDs require more power than that PoE PSEs can provide. PoE plus technology is also prevalent in business applications. For example, some managed gigabit switches based on PoE plus technology deliver robust performance and intelligent switching for growing business networks. With the rapid growth of telecommunications, the use of PoE to power devices such as wireless access point, VoIP phones, and computers is also getting frequently. Therefore, demand for PoE goes up, so does the demand for the amount of power provided, which put forward more requirements for PoE. Another problem is the overall power draw to the switch itself. PoE is increasingly being applied to provide power to devices like phones, surveillance and laptops used in our daily life. And PoE switches and PoE media converters for Ethernet networks bring convenience for small business networking systems. Getting understanding of the basic components of PoE is beneficial to make it work better for our life. For many network devices, like IP cameras, two connections would normally be needed—an electrical connection and the actual network connection. 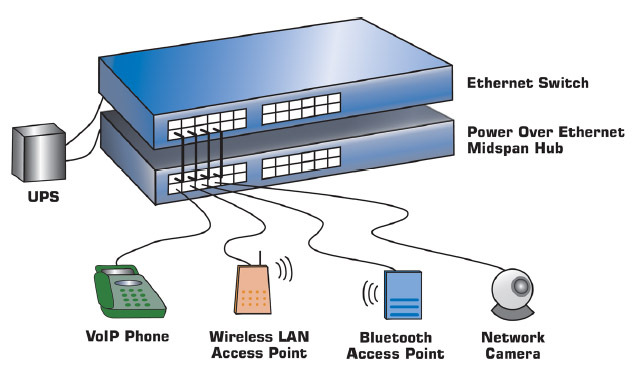 The electrical connection offers the necessary power for the device, and the network connection allows the device to communicate with the network. It’s obvious that cost will be increased if both of the connections are installed at the same time. However, PoE (Power-over-Ethernet) provides a cost-effective way for this kind of problem. Here are some basic introductions about PoE that you may be interested in. Do You Really Know Clearly About PoE? Maybe most people know that PoE is a technology that enables powered devices such as surveillance camera and VoIP phone to receive electrical power and data over the same Ethernet cable, supporting the same 100m transmission distance, which eliminating the need for another electrical connection and power lines. However, do you really know clearly about PoE? Here, in order to get further understanding of PoE, I’d like to list several most common misconceptions, which offers a new way to help you know clearly about PoE in some degree. In the early days of PoE, it’s true that many proprietary schemes needed to get power on network cables. However, with the development of PoE, the IEEE 802.3af standard has achieved universal adoption, which means that the compatibility issue between all PoE equipment is assured. Power Is Forced into Devices. This misconception is the most common one. But what we should keep in mind that the power ratings marked by manufacturers is not fixed. Plugging a 5 watt camera into a 15 watt injector does not result in 10 watts of power being lost somewhere. Instead the camera will simply draw as much electrical power as it needs. This conception is not right at all. Because common cables used in networks such as Cat 5e, Cat 6 and Cat6a, and RJ45 connectors are also can be deployed for PoE-enabled local area networks. Besides, power-sourcing equipment such as a PoE switch or PoE Injector utilizes a power supply and help network link to a powered device. Apart from data communications between two devices, PoE also enables an Ethernet switch/Hub to power a remote device over an existing LAN cable. 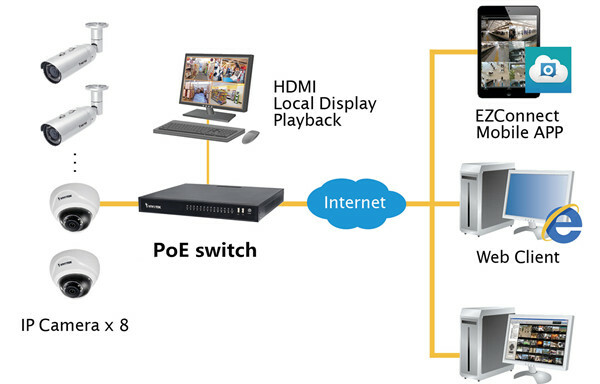 Without PoE, any remote device needs to be powered independently. And PoE also has many other applications. Here are three major applications of PoE: network cameras, wireless access points (WAPs) and voice-over-IP phones (VoIPs). Following is a simple diagram of PoE application. What’s the Major Advantages of PoE? Installing PoE to your network will bring lots of advantages that you cannot ignore. By deploying the PoE, there is no need to install conduit, electrical wiring and outlets throughout the facility, which provides a significantly reduction on investment. What’s more, as PoE runs via one cable directly, it also takes less time to install. In terms of the nature of systems, fewer electrical cords and power plugs mean more reliable, for there is less chance for a malfunction or other problems. For example, power maybe need to be cut down by an electrician who was called to rewire the electrical circuits. When planning out the location of access points, designers know there are always existing different problems. However, PoE enables designers to have more flexibilities, because they are not limited by the need for proximity to electrical outlets. And this also makes the deployment easier and cheaper for future modifications such as relocating access points or increasing network capacity. Many PoE devices utilize the simple network management protocol (SNMP), which offers the electrical power supplied to access points in remote management. For instance, the power to a PoE-enabled access point can be shut off remotely following detection of a security breach. Therefore, other SNMP-based features allow the power supply and consumption levels to be monitored by systems, which effectively ensures the network operations. In summary, it is no doubt that PoE is an innovative technology that provides a more convenient, flexible and cost-efficient method for powering network devices. And there are many products supporting PoE in the market such as injectors, PoE switches, PoE media converters and network interface cards. For more information, please visit FS.COM.